Ghent (Belgium) (AFP) – A painstaking restoration of the “Mystic Lamb”, a 15th-century Flemish masterpiece by the Van Eyck brothers, was unveiled on Tuesday, revealing a “much more expressive and intense” version of the central image of the giant altarpiece. Restorers from Belgium’s Royal Institute for Cultural Heritage began working on the altarpiece in 2012, but in recent months focused on removing the overpainting from the central part of the work which includes the head of the lamb. And the results were unveiled at St Bavo’s Cathedral in Ghent on Tuesday, with the restorers highlighting a number of surprising discoveries about the altarpiece, which is one of the world’s most stolen artworks. “The head is very different from what we’ve known since the 16th century. 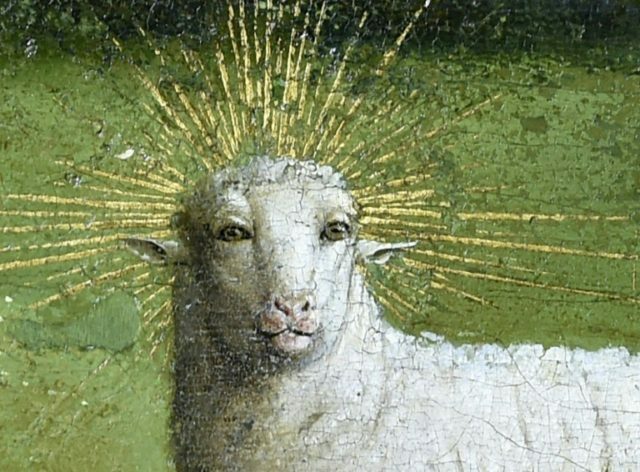 It depicts a lamb which is much more intense and expressive, which connects far more directly with the people, with big eyes,” restoration project leader Helene Dubois told AFP. “We didn’t know how much this panel had been overpainted during the 16th century, we have rediscovered the original painted by the Van Eycks,” she said of the giant 12-panel altarpiece, which measures 4.4 metres by 3.4 metres (15 feet by 10 feet). “The Adoration of the Mystic Lamb”, which completed in 1432 by Jan Van Eyck and his brother Hubert, is made up of hinged panels that can be opened and closed, with images relating to passages in the Bible and daily life in Ghent when it was the wealthy powerhouse of the European wool cloth trade. The work was first unveiled at St Bavo’s Cathedral 600 years ago, but its glory had dimmed after being split into pieces, seized by Napoleon, then the Nazis, and also nabbed by thieves. The full restoration of both sides of its 12 hinged panels is due to be complete by the end of 2019, Dubois said, just in time for the start of a year of celebrations centred on the works of Jan Van Eyck.